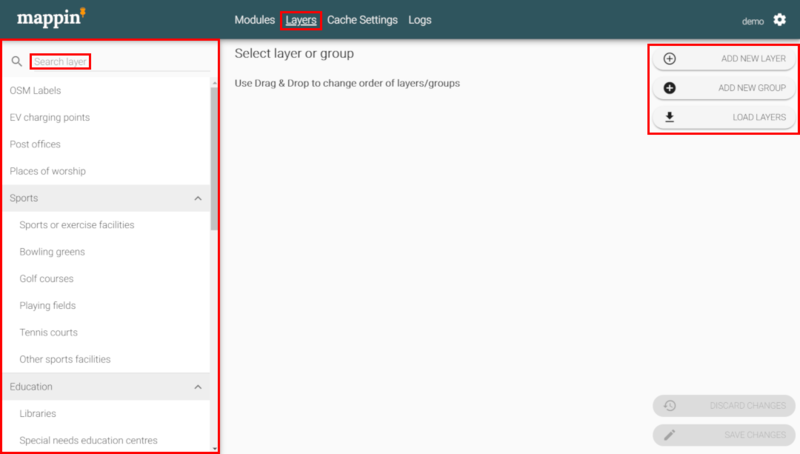 The Layers menu is used to configure all settings related to layers, how they are displayed and grouped. The project’s layers are shown in the left-hand panel and can be re-ordered (and assigned/unassigned to groups) by drag-and-drop. The Search layer tool (top-left) can be useful for quickly locating layers. ADD NEW LAYER - Adds a new layer to this project and opens its general layer settings. 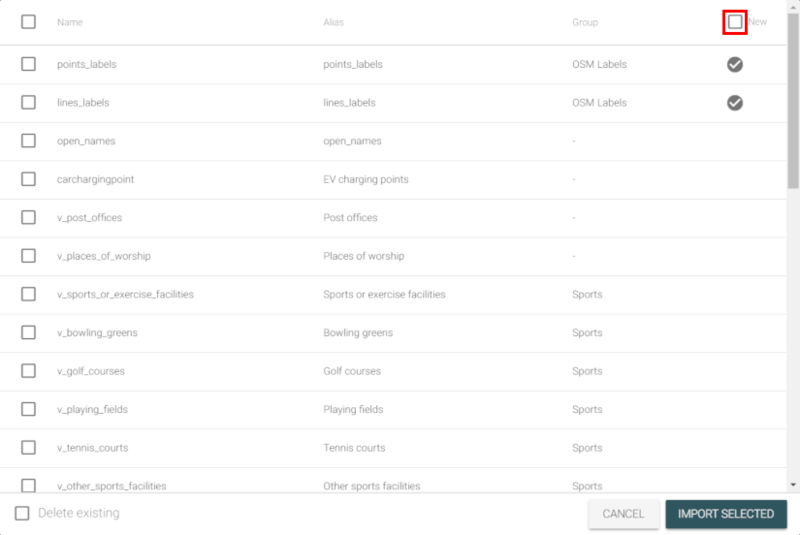 ADD NEW GROUP - Adds a new layer group to this project and opens its group settings. LOAD LAYERS - Opens a dialog for batch-publishing multiple layers available from Mappin’s WMS server (discussed below). The Load Layers dialog can be used to batch-publish multiple layers. The tool sends a (GetCapabilities) request to Mappin’s WMS server for a full list of available layers. For each layer, it reports its Name, Alias and Group (if any). A special column (New) will feature a check if you do not already have a layer published in Mappin with the same Name. Entries without a check indicate layers you have already published in Mappin. The New checkbox (top-right) filters the list to only show layers you have not already published through Mappin. The IMPORT SELECTED button will create new layers in the current project for the selected layers using default settings, populating alias and group settings where possible. If you import a layer with the same Name as a layer you have already published, that published layer’s settings will be overwritten with default layer settings.